If you really THINK about it, none of these are REAL. They are all artificial constructs of society. Three are based on religion beliefs, and the other on social laws, rules and customs. We blindly live our lives as if they were real and truth. Those in the present position of power know that if you can indoctrinate the mind and control the social Belief Systems (BS), you can control the masses. 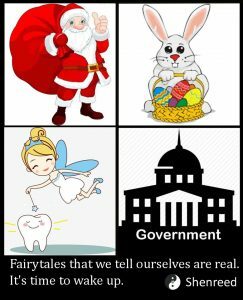 This entry was posted in Conspiracy - NWO, Media - Internet, Military - Police - Laws, New Age, Politics - Government, Religion, Self-Empowerment, Society - Culture and tagged Easter Bunny, government, Santa Clause, Toot Fairy by johnrieger. Bookmark the permalink.